The Shadowy Glade is a comfortable and relatively hidden place surrounded by many tall trees. In the middle is an open area where wild flowers grow during the summer. 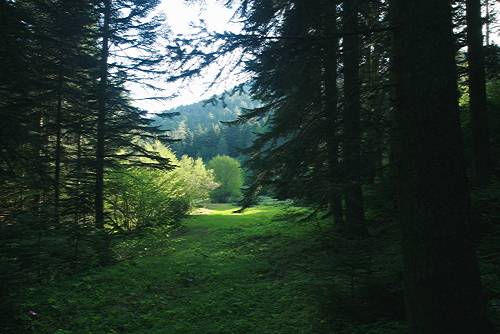 Even in winter, the glade is warm compared to other parts of the territory. It is a good place where the pack could come and enjoy the day. The ground is covered by a soft layer of grass, making it a great place to rest in. Rez entered the shade and flopped down. "It's lower altitude here. But do you like it?" "It's beautiful isn't it." she said, trying not to make him too embarased and but she was thrilled at what he said. "Are you sick?" she whined and nudged him gently. Rez laid at his side, and licked him gently. He saw it was dawn and the birds bussling around. He decided for an early morning hunt. Rez licked him gently as she woke. "So how are you my brave Fang?" she said this softly, her tone husky. "Actuallly, I did, it was about..." she stopped as she began to blush. "You knew what it was about? Rez looked at him a moment then snuggled against his side. "I was just dreaming about us being together." she blushed again and licked his muzzle softly. Rez spoke slowly, "I want to be your mate." Then she looked away afraid to see his rejection. Rez shivered and a blast of heat ran throughout her entire body. She lay down swiftly suddenly feeling dizzy. Seeing rezia dizzy he climbed over to her side and held her then said "are you ok rezia?" "Everything's spinning." She said closing her eyes.